Which Style of Backpack is Best for Travelers? Deciding between a top or front-loading backpack is one of the most important choices you can make when it comes to travel. Pick the wrong one and you'll find yourself trudging from hostel to hostel with an ill-fitting pack and a pack-induced backache. It is not an uncommon issue. The most important thing to remember is that you'll likely be carrying your backpack from place to place several times a week, so making sure it's comfortable and offers support for your back, shoulders, and waist is of utmost importance. You'll also find yourself unpacking and repacking your backpack at least once a day while you're staying in hostels, so you'll want to make sure it's quick and easy to do. So the decision is: front-loading or top-loading. There are benefits and problems with both. Here's how to weigh-up which option is best for you. For some travelers, the front-loading one (the Osprey Farpoint pack, for example) is the pack of choice for several reasons. They're more secure: In general, front-loading backpacks offer more security than top-loading. While it's rare you'll be robbed on the road if you're nervous about it happening, these packs offer greater peace of mind. Front-loading backpacks work more like a suitcase with straps, in that they're secured with a zip around the front. What this means is that you can easily add a padlock to the zipper in order to prevent thieves who are looking to make a quick steal. Top-loading backpacks are often secured by a drawstring and plastic clasps, making them easy to get into. There isn't really much you can do to secure them beyond buying a mesh protector for your backpack. They're easier to pack: Front-loading backpacks are significantly easier to pack and unpack than top-loading ones. Simply unzip your backpack, and it'll function like a suitcase—you'll be able to place everything exactly where you want it to go while avoiding the struggle of trying to shove everything through a tiny hole at the top. Travelers often regret having to unpack their top-loading backpack to find something that had worked its way to the bottom only to have to do it again ten minutes later. With a front-loading backpack, you will no longer feel as though you are packing and unpacking every day. They're sturdier: The front-loading backpacks are usually made of a much tougher material than their top-loading equivalents. This is usually because top-loading backpacks are designed for hiking and adventure activities, where weight matters. But then it depends on the brand and materials. Travelers have reported having a front-loading backpack ripped apart in the cargo hold of a plane while their friend's top-loading backpack remained in one piece. They're less likely to have a frame: There are two schools of thought as to whether a framed backpack is a good or bad thing. It can help your pack keep its shape if it's not completely full, but it can also render your bag unusable if the frame breaks. Most travelers place having a frame in the disadvantages column, giving a front-loading backpack another check. Top-loading backpack enthusiasts travel with packs like the Osprey Exos backpack and love it. It is lightweight, easy to carry, and perfect for a smaller person. Unfortunately, there are a few disadvantages like those mentioned above. They're better for smaller people: Top-loading backpacks are thinner than front-loading ones, which makes them much easier to handle if you're walking through crowds or trying to make your way down the aisle of an overcrowded bus. If you're a smaller person, you'll find their thinner width fits better to the shape of your back, making it much easier to carry. This is a huge advantage of a top-loading backpack. 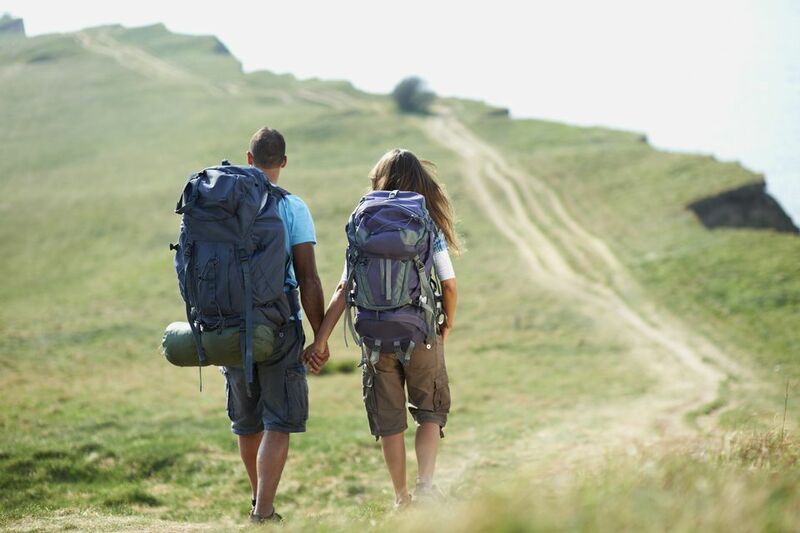 They offer better support: Top-loading backpacks are typically made for long-distance hiking, which means they're built to take the weight off your back and onto your hips. They're more comfortable for walking long distances. Some are so comfortable, you may often leave it on your back when taking a break from walking. Some report happily carrying it for hours without getting tired. If you don't have much back strength and struggle to walk with a heavy load in your pack, a top-loading backpack will definitely be more manageable for you. They're lightweight: Because they're usually hiking backpacks, they're made to be as lightweight as possible, which makes carrying your bag even easier. After half an hour spent wandering around in circles looking for your hostel, you'll be grateful your bag isn't any heavier. You just might find that your top-loading backpack will feel lighter on your back than it did when lifting it. Head to an outdoor store that specializes in backpacks, such as REI, and try on both front and top-loading backpacks. See which feels most comfortable and offers the best support. Make sure to fill the backpack with random things from the store to see how it feels once it has some weight to it. You may find that you prefer comfort for that time you find yourself wandering up and down the same few streets trying to find your guesthouse in 100-degree heat. Some of you may prefer the peace of mind that comes with being able to padlock your bag. It depends on what your priorities are, and the best way to figure that out is by checking out the backpacks in person and seeing which ones work best for you. Shorter people find the top-loading backpacks far more comfortable to wear than front-loading ones. The Osprey top loading backpack, for example, seems to drastically decrease in weight when you put it on your back—a major selling point. There are definitely a few security issues that come with buying a top-loading backpack, though —the top of the backpack is closed with a drawstring and clips, which couldn't be further secured with a padlock. If somebody decided to steal something it would have taken them all of about five seconds to get inside and pull some things out. With a front-loading backpack, the heavier of the two, travel days are much harder and you can't walk as far when wandering around trying to find a hostel. For many, though, the added security and ease of packing makes a front-loading backpack worth it. You can lock your backpack when heading out to explore and know your things are safe, and if you ever need to find something in your backpack, it takes twenty seconds rather than five minutes to locate it. Osprey backpacks are one popular brand because they have a lifetime guarantee—if any of their backpacks break for any reason, they'll replace it with no questions asked, even if the pack is 20 years old. Which To Buy, Compression Sacks or Packing Cubes? Should You Take a Backpack or Duffel on Your Next Trip? Is the Minaal 2.0 The Ultimate Carry-On Bag for Frequent Travelers?